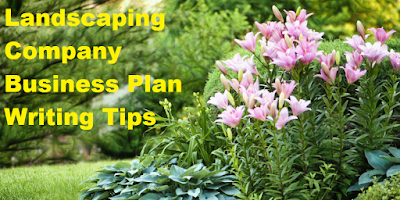 Landscaping Business Plan Tips by a Professional Business Plan Writer. A landscaping business plan can help landscaping companies grow into successful and profitable ventures. If you're thinking about starting a landscaping company, then laying out your business plan is instrumental in the growth of your company. If you already have a landscaping business, then outlining your business plan will help business growth. Understand how much the going rate is for landscapers in your area. Generally in the landscaping world, there is a going rate per man-hour. This means that if you have five people on a project and you are paying each of those people $10 an hour, then your cost for the landscaping project is $50 an hour. A landscaping company would charge $100 an hour and keep the difference after they pay their landscapers. It is important to understand the going rate for manual labor in your area in order to effectively complete with other landscaping companies. At times, landscape projects are invoiced out by project. This distinction will change forecast and projections in your business plan. Be sure to understand how income will flow in and out of your business in order to be successful. Sometimes it's better to rent landscaping equipment than buy landscaping equipment. This is not a blanket statement, but sometimes it is more cost effective to rent equipment as needed then to purchase the equipment outright. A serious analysis should be done to make sure that the company can grow profitably. Depending on the job, it may be better to buy the equipment and sell it after (or keep it). Or, rent the equipment for that one particular landscaping job. Make sure to project your financials accordingly in your business plan. If you are just getting started and do not have much of a marketing budget, do not expect your client or customer base to grow exponentially within the first year. Being realistic in your landscaping company business plan is important to the success of the venture. Understand at what rate you are comfortable growing. Some companies can sustainably grow their landscaping business at 20% year-over-year growth. While other companies can grow up to 100% in the first year depending on how they market their services (this should be showcased in the marketing plan section of the business plan). Depending on whether your landscaping business is already established or is a start-up will depend on how fast the company will grow. Use credit lines to build your landscaping business. The best part about a landscaping business is that you can get clients before you buy the equipment. This allows you to safely project revenues and allows a Founder the opportunity to use credit lines to expand their revenues. For example, a credit line can be used to pay for man-hours or equipment rentals before an invoice is sent out for the landscaping project. Then the business owner can pay the credit line when the customer pays the invoice. This allows for perpetual growth of the company with little to no investment upfront.